This article links to all resources from Net Inclusion 2018, Cleveland Ohio April 18-19. This 2-day national conference brought together USA digital inclusion community practitioners, advocates, academics, Internet service providers, and policymakers to share digital equity, digital inclusion programs, and digital inclusion best practices. Although the conference keynote was access to competitive, affordable Internet connectivity – an aspect where USA is lagging well behind New Zealand and other countries – many sessions had resources of use to people working for Digital Inclusion in New Zealand. These resources are all linked below, under a link to each session’s purpose & speakers. There were many other sessions that, at time of publishing, had no resource links. These may be added over the next few days. See https://www.digitalinclusion.org/netinclusion2018/ and https://netinclusion2018.sched.com. 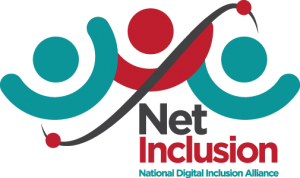 Net Inclusion 2018 was run by the National Digital Inclusion Alliance.